Miami Design District’s latest garage has opened to the public. The project is a collaboration between WORKac, J. Mayer H., Clavel Arquitectos, Nicolas Buffe, K/R Architects, and Sagmeister & Walsh. Each firm has designed a portion of the garage’s facade to produce the effect of a collage spanning the entire enclosure. WORKac’s facade consists of a four foot thickened space that allows for a vertical progression of public spaces, including a graffiti art gallery, children’s play area, a garden, a DJ platform, lending library, listening lounge, fountain, bar, car washing/charging station, and space for pets. 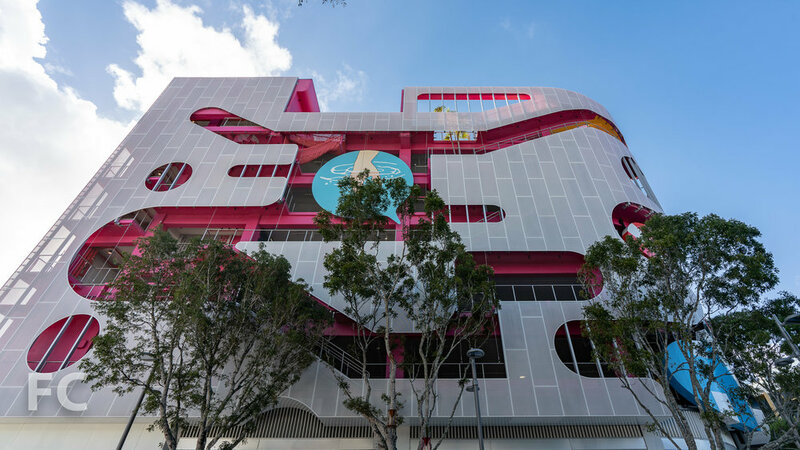 Architects/Designers: WORKac, J. Mayer H., Clavel Arquitectos, Nicolas Buffe, K/R Architects, and Sagmeister & Walsh; Program: Parking Garage; Location: Miami, FL; Completion: 2018.